Welcome to Nissan Juke : Juke Forums - a website dedicated to all things Nissan Juke. You are currently viewing our forum as a guest, which gives you limited access to view most discussions and access our other features. By joining our community, at no cost, you will have access to post topics, communicate privately with other members (PM), respond to polls, upload content and access many other special features. Registration is free, fast and simple, Join Nissan Juke : Juke Forums today! I got fed up shopping for Jeeps very quickly, they were expensive and you didn't get much more than an (admittedly) solid drivetrain and a piece of canvas to keep you dry. But that was probably an indication that I should let people know that I'm working on this project pretty seriously, even though I'm broke and It's going to take forever. and yes, I am insane. Also shout out to NISMO Offroad, he is the OG and forum LEGEND, and I don't want to steal his thunder - even though this build is gonna get real obnoxious, I am certainly not the first person to do an offroad Juke build. Looks Great. Juke scales so well raised and lowered. injen short ram intake, injen intercooler pipes, turbo smart compact bov, stillen strut bar, full obx exhaust include second cat delete, 2j pulley, 2j mail order tune with uprev, mishimoto front mount with custom pipes and brackets, 2j shift knob, nismo pedals, rock blokz mud flaps, greddy profec electronic boost controller, sti battery tie down. Great start. Love those tires! Can’t wait to see further what you come up with. Still wish I could go over 28” tires without cutting the bumpers! I drove over a fountain drink in the parking lot the other day thought I may clip the straw but didn’t. Last edited by Nismo Offroad; 12-21-2018 at 02:40 AM. 3" Stright exhaust 2nd cat delete, GFB BOV, Rokblokz Red Mudflaps, 15" Drag wheels 14.5lbs, 295/50R15, 42" LED light bar, Bull Bar w/fog lts, WELL visors painted, Bc Coilovers 2"F 2.5”R lift, Red 2J Hoses, & Pulley, Blk Injen SRI & IC pipes, MRP FMIC, All door handle covers, Rear Cross Brace, IRZ strut bar, Tornado Airhorn, Red Daymaker headlights, Fender flares, Stillen sway bar, tow hook, Decals! Love that you started a thread. 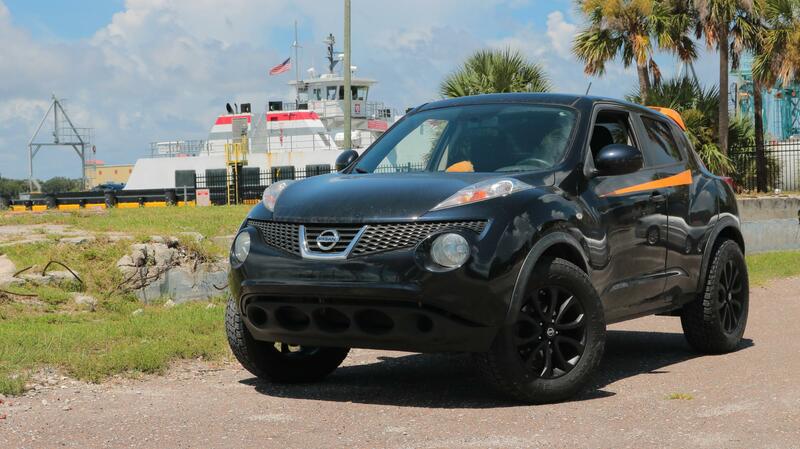 Awesome looking juke. Glad to see I am not the only crazy one that wants to do this to my juke. 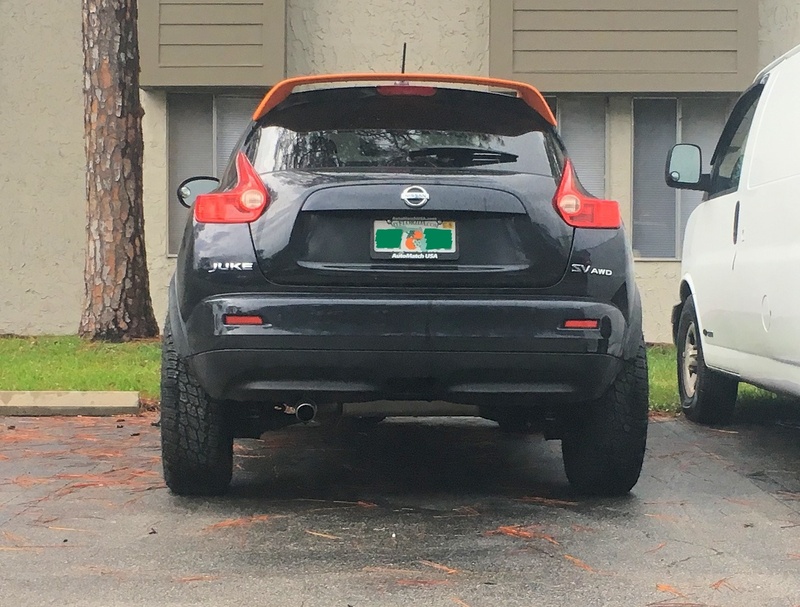 I have been driving 4x4 vehicles since the beginning so, being in a "normal height" car is hard but I enjoy the extra few MPGs the juke gets over my current 4x4, my 07 offroad nissan xterra. Last edited by steve500; 12-21-2018 at 06:01 PM. Hey everybody, early February update! I've been living with these 29.5s since August, each tire is a whopping 11lbs over stock and I've put around 6000 miles on them so far. It didn't affect the drivablity of the car NEARLY as much as I had initially feared and I have to say I probably drive my car even harder now than when I first got it. I still enter tight right hand turns at 30mph, and always get to the front of the line at a stop light just so I can launch past everyone about 0-50 and then ease back down to whatever the speed limit is, lmao. After about a month of driving I tested the speedometer and the odometer and the car was reading everything accurately, this is without me doing anything to the ecu whatsoever, it had relearned everything completely on it's own. My Juke has the SV trim with the navigation so I assume it recalculated it via GPS signals, but after reading through the service manuals, I have no idea if that is actually a thing. That being said, I think the car has also adjusted how the CVT responds as well. It's probably a little bit slower 0-10mph, but everything past that pretty much feels the same. I've gone from about 19-21mpg to about 17-19mpg according to the display, but like I said, I drive it way harder than before overall. let's call it a "responsible mod" because for the most part the fastest anyone really needs to drive on the highway is like 80. I'm gonna go ahead and put it out there-- the way the car has handled this so far has made me feel pretty confident in pushing it further. And you can all go ahead and doubt me if you want, but I've spent the past year measuring and doing the math, and it should only rub a little bit on the front subframe at about 90% lock. Because of course they'll rub, it's 33s on a Juke, I may be crazy, but at least I'm honest about it. It is a great mod for sure. Glad you are having fun with them and they work well. On a side note. The tires are 3" larger on the diameter. 26.375" diam vs 29.5" diam. 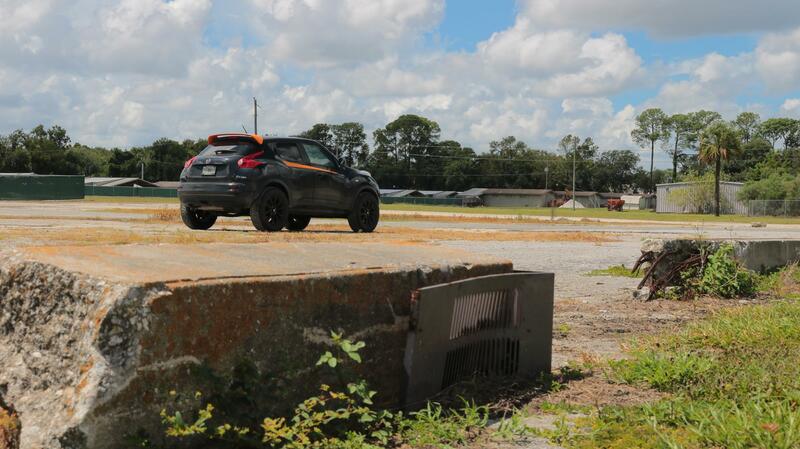 The Juke ECU does not learn tire size. My Taurus SHO. You can input the changes into the menu and the car will adapt. The speed and mpg differences you see are from this tire change. Its about a 10% change. Right where your MPG is and your MPH are. Its all good. Not complaining. Just clearing some things up so if anyone else wants to do this they know ahead of time what they will lose/gain. If that's the case then my car should be traveling 12% faster than the speedometer, and the odometer should be 12% less than the actual miles I've traveled. As far as I can tell this does not seem to be happening; I took a 1300 mile round trip to Charleston WV and when I got back the trip meter was just a little over 1300, without any sort of correction, it should have been about 1100. And I mostly drive on the highway at 80, so if I was actually doing 90 in a 65, I probably should have been arrested by now, lol. Did you think about testing with a mobile navigation. This should be able to messure the speed an log the track..
Last edited by Herman.TM; 02-05-2019 at 01:50 AM. can I go 235/75/15 offroad tire? Anyone try going for an rugged offroad look?